Sonic Geographies takes sound as the entry point for excavating and mapping urban experience and invisible infrastructures of the city. A series of experiments and scenarios are being developed that operate as maps and journeys but also as highly personal renderings of sonic experience – sounds of the personal world in conversation with sounds of the city. The mappings attempt to excavate the layers of sound that make up the city and create strata of difference: from the sound of a city's church bells to the shifting sonic signatures of traffic, music radio and the layers of wireless communications. Sound eludes systems of representation: this process of excavation will entail developing a graphic language and notational system for representing and articulating sonic difference, and the inter-relationships that occur as urban experience. The excavation is designed to open up a new space of enquiry into the experience of the city, and how sound functions as a kind of infrastructure for understandings of place and geography particular to contemporary conditions in the city. URBAN TAPESTRIES is an interactive location-based wireless application allowing users to access and publish location-specific multimedia content (such as local historical information, personal memories, pictures, short movies and sounds). It is a forum for sharing experience and knowledge, for leaving ephemeral traces of peoples’ presence in the geography of the city. Team: Alice Angus, Daniel Angus, John Paul Bichard, Kat Jungnickel, Giles Lane, Rachel Murphy & Nick West with Professor Roger Silverstone and Zoe Sujon. 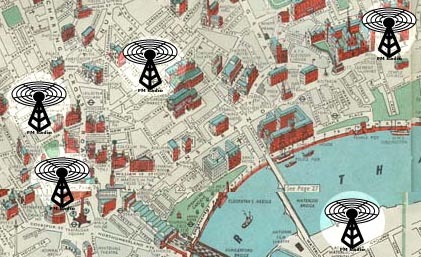 TIMESTREAMS a series of 24 downloadable DIFFUSION eBooks and short range radio broadcasts, each mapping the soundscape of a particular area of London during one hour of the day. Team: Alice Angus, Kat Jungnickel & Giles Lane. SOUNDSTREAMS a series of soundworks giving commuters an alternative, vicarious sonic journey to the soundscape of their habitual journey. CITYCUTS aims to encourage people to value and share their own personal maps of the cityscape. CityCuts can be manifested in a variety of forms and put into the public realm without delay. It could be a freely-distributed fold up map with a selection of routes printed onto it or a series of instructions for turning the city into a something akin to a psychogeographic board game. Alternatively it could be a series of events where the tour guides, drawn from the participants, lead groups on a personal drift through the city. EXPERIMENT 1 was a presentation at the Architecture Foundation as part of the Calling London series. Integral to its 'mappings' were a series of original field recordings functioning as 'markers' of social, cultural, and personal movement and experience. Sound was used as a means by which to 'gather information' as well as to personally negotiate the urban landscape. This experiment attempted to expose the different environmental characteristics of London's soundscape and how this might lead to new reflections on the relationship between movement and change in and through the city.